It had been two years since my last visit to PPA, so it was great to return. 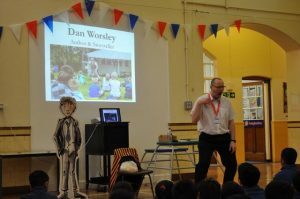 The morning kicked off with an author assembly. I got the children up to speed with the books that have launched since my last visit. They discovered how much editing it takes to create a story and saw some of Martin’s marvellous illustrations at the various stages of development. The session finished with a performance of one of the Impossible Tales. 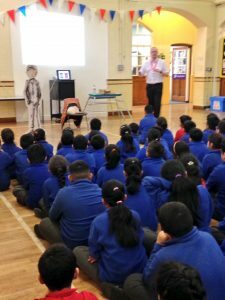 The pupils laughed at all the right moments, which was ace! After catching my breath, I joined one of the Year 4 classes for a writing session. The children pulled apart an unpublished piece of text and helped me edit it, adding their own ideas. They planned out an alternative version and I left them to write as I joined the other Year 4 class to repeat the session. Two fantastic sessions! The morning concluded with a lunchtime book signing. 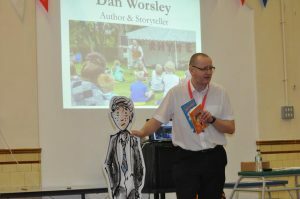 It was lovely to chat and sign books – the pupils were ace! Thanks must go to Miss Reardon for organising the morning and promoting the book signing so effectively.